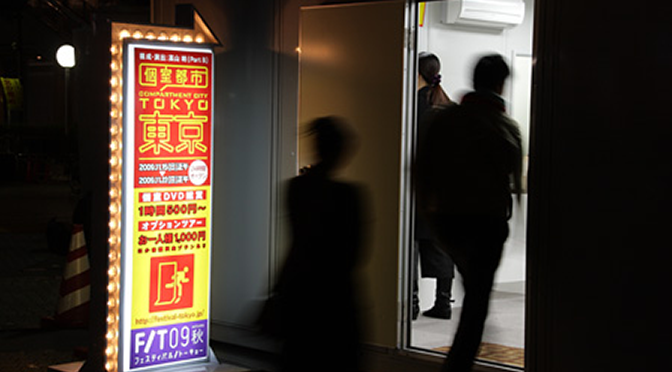 A special prefab building with 24-hour video-viewing booths was installed in Ikebukuro Nishiguchi Park in north Tokyo. Visitors paid to enter and were then free to watch any DVDs they wanted. The videos featured interviews shot in Ikebukuro Nishiguchi Park. From morning until late at night, a never-ending flow of people passes through this public plaza. Who are these people? How can we hear their hidden voices? The interviewees varied in ages, genders and nationalities, but they were all asked the same questions: What do you want the most right now? Do you think Tokyo is a good place to live? Do you think Japan is rich? What is your dream? What are you? After watching the videos, audiences were offered the chance to take part in an optional tour: an “evacuation drill”. They were given a map taking them through Ikebukuro’s underground passageways to a room in a building where there was an “encounter café”. Visitors could choose a conversation partner through one-way glass and then engage them in a ten-minute dialogue. A final epilogue took place at a small room overlooking the park. In 2010, “Compartment City – Kyoto” was created for Kyoto Experiment. In 2011, “Compartment City – Vienna” was created for the Wiener Festwochen.